The poles of the Moon are strongly influenced by large impact basins, but the effects are strikingly different. The South Pole is marked by a string of tall mountains, supposedly the tallest on the Moon, that are part of the rim of the South Pole-Aitken Basin. This was first - I think - guessed by Hartmann and Kuiper in the early 1960s when their study of basins demonstrated that mountain ranges are rims of basins. Jumping 180 degrees to the north, the polar region there is dominated by light plains that fill craters and the places between them. The plains are ejecta from the formation of the Imbrium Basin, but not the strong, coherent ejecta fragments that roared across the Alphonsus highlands, scouring and gouging valleys through crater rims. Nor the viscous sludge that flowed over Julius Caesar, massively burying craters and creating a flow terrain. North of Frigoris it looks like the ejecta was perhaps ballistic, settling in low spots. But somehow it also destroyed many crater walls facing the basin. In Pete's image, the librations (not vibrations) were very good, showing that even Hermite, the 104 km wide crater almost at the limb, is full of plains ejecta. 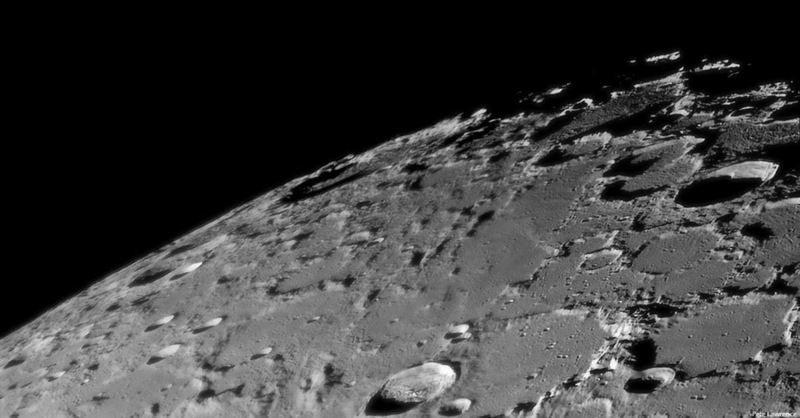 Anaxagoras, the bright crater in the foreground is clearly younger than Imbrium and its debris. Jan 5, 2010, 2:43 UT. c-14 at f/28, Astronomik Type-2 filters, Skynyx 2-0M. This page was last modified on 24 April 2019, at 01:02.